The San Geronimo Lodge was built in 1925 in native adobe with vast common areas, high ceilings set with traditional vigas, rambling verandas and winding portals - all situated on 2.5 acres of tree and flower filled grounds. Completely restored in 1994, the Lodge truly offers the best of both worlds historic ambiance and charm with all the comfort and convenience of modern day accommodations. 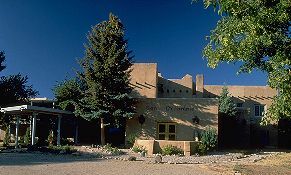 Near world-class downhill and x-country skiing; white water rafting; horseback riding; art galleries; museums; Kit Carson National Forest; Taos Pueblo. Sports packages available.